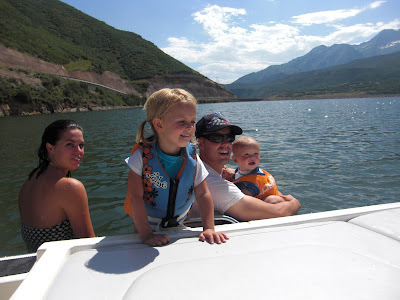 Here are some pictures of a great afternoon spent on my brother's new boat. He is single, owns a home, a boat. a bachelors and a masters degree. On top of all that he is cute. And single. Did I mention he is single? If you know any cute 20 something girls, let me know. Thanks for a great afternoon Derald. The highlight had to be Emmett. He relaxed like boating was old hat. Too cool for all of it. For 3 hours he reclined in the corner, munched on some oatmeal cookies, sucked on his nukie (pacifier), and on occasion tossed the nuk overboard and attempted to tumble headfirst after it as it floated away. 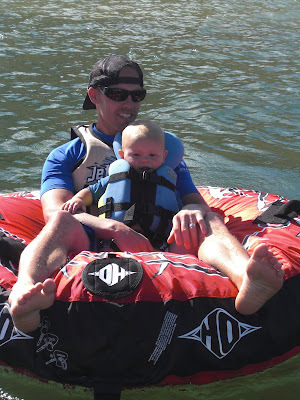 The only time he cried was when we attempted to extract him from the tube with his father. Cousin Elizabeth spent a few days with us this week. 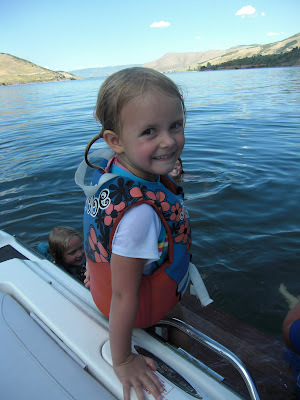 She was a little unsure of the boating, but still had a great time. That looks like too much fun! I love summer. Derald is quite the catch! 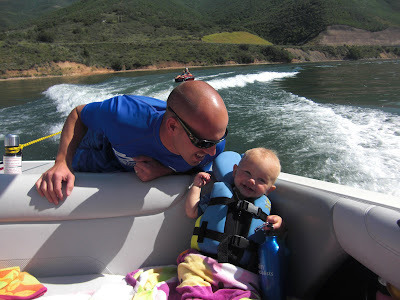 And how fun that you get to go out on his boat! Looks like you all had a great time.